A generalized anxiety condition is defined by constant feelings of fear or worry. The mood swings and hormonal changes that happen during menopause can sometimes aggravate anxiety conditions. There is a variety of anxiety treatments that have been shown to work, including self-help remedies and medical therapies, such as the ones mentioned below. For overall health, it is generally recommended to do at least 150 minutes of exercise every week. However, aside from benefiting the body, exercise also benefits the mind; it encourages the release of serotonin and endorphins, which naturally elevate mood. Studies have shown that these neurotransmitters relieve anxiety, meaning that exercise is an effective treatment. Cycling, swimming, or aerobics are just a few examples of activities you could try. Lack of sleep can cause moodiness and unreasonable thoughts, and this can add to any existing anxieties you might have. Less sleep can also raise levels of cortisol, a neurotransmitter associated with stress. Consequently, sleep and maintaining a regular sleep schedule is one of the best natural anxiety treatments. Dedicating more time to an existing interest or picking up a new hobby can help control the anxiety in your life. Everyone has different interests, but spending time on things you are passionate about can soothe anxiety and give you an outlet. Your outlet can be anything from an artistic pursuit like painting, sculpting, or learning a new instrument, to a physical activity like rock-climbing, biking, or tennis, or something completely different like bird-watching, learning a new language, or baking. Talking about your problems is a therapeutic act, and there is counseling available - talk to your doctor to see what local services exist in your area. Some people might benefit from group therapies, whereas others might feel more comfortable in a one-on-one situation. Online and in person support groups and telephone help lines are also available to people with anxiety conditions. However, if the idea of talking to strangers does not appeal to you, talking to a loved one about your feelings can also help. The most important thing is to reduce feelings of isolation. CBT is an evidence-based psychological treatment that has been shown to be effective. Anxiety is mostly about thought patterns; negative ones can give rise to the physical symptoms that many people with anxiety experience. Therefore, by altering the way a person with anxiety thinks about certain situations, the way they act in those situations is also changed. 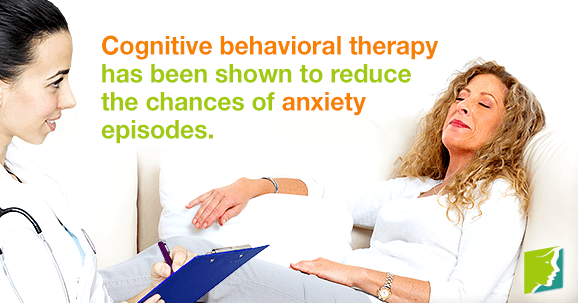 CBT has been shown to reduce the chances of anxiety episodes. There are many anxiety treatments available, and the best way to decide which ones will work for you is by consulting a professional and finding out the full facts. Lifestyle changes should be the first step, and they will also complement any medical and behavioral treatments well.